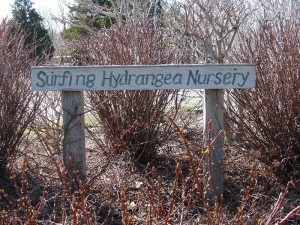 Grasses Archives - Surfing Hydrangea Nursery, Inc.
Ornamental grasses have been part of the plant palette on Nantucket as long as I have been gardening here. They are deer resistant, low maintenance and easy to grow with little pest or disease problems. They are also beautiful. Although there are many native grasses available, most of the species that we sell are of Asian or African origin. Maiden grass and fountain grass are neck and neck for our top sellers. Unfortunately, both have the potential to produce viable seeds by the thousands in warmer climates. There is a fear that these vigorous plants could become invasive, if temperatures continue to rise. Luckily, there are many grasses that have evolved in North America that are well-adapted to our growing conditions. Switch grass, aka panic grass, is one of those. 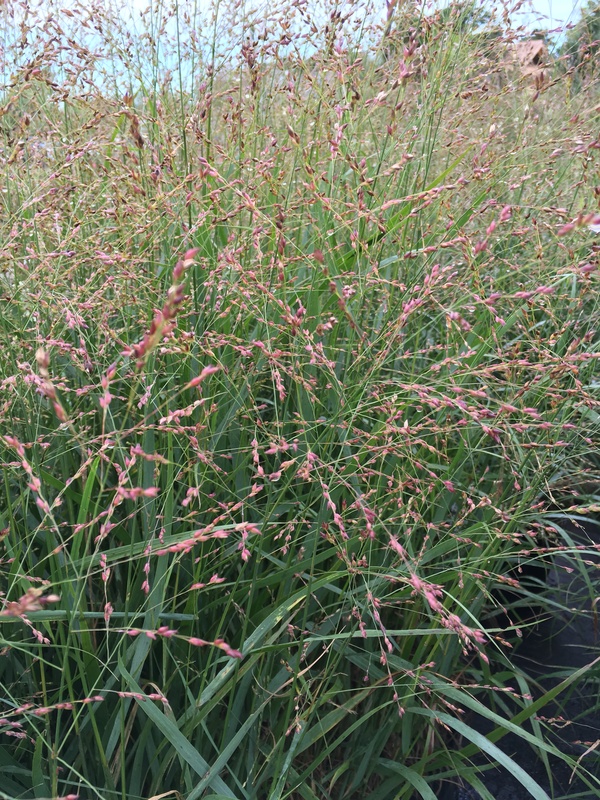 The botanical name for switch grass, Panicum refers to its flowers, which botanists call paniculate, or many-branched. Panicum virgatum, is the most common species we sell in this genus but there are also other species available in commerce. As a whole, switch grasses are extremely adaptable. They thrive in full sun in average soil with even moisture, but they tolerate short periods of drought and light shade. Although many cultivars have a naturalistic, almost weedy, appearance there are many varieties on the market that have tidier habits as well. ‘Northwind’ has a very tight, upright form; ‘Heavy Metal’ is also very upright, but somewhat looser. If a tall, narrow form is called for, try ‘Thundercloud’. A large cultivar like ‘Cloud Nine’ would replace a tall maiden grass very well in a design. Where a shorter plant is desired, ‘Rotstrahlbusch’ or ‘Shenandoah’ would swap in nicely. Try ‘Dewey Blue’, ‘Dallas Blues’ or ‘Prairie Sky’ if bluish foliage is up your alley. Still others have been selected for red/purple streaks in the foliage. ‘Ruby Ribbons’ ‘Shenandoah’ and ‘Rotstrahlbusch’ will all show purple on the leaves during the growing season. Now that the worst of wintry weather is over, and the soil is workable, the number of garden chores is stacking up quickly. One of the chores that tends to get left off the list year after year is dividing ornamental grasses. Maiden grass (Miscanthus sinensis), in particular, tends to outgrow its space and die out in the center. This can also be an issue for larger fountain grasses (Pennisetum). 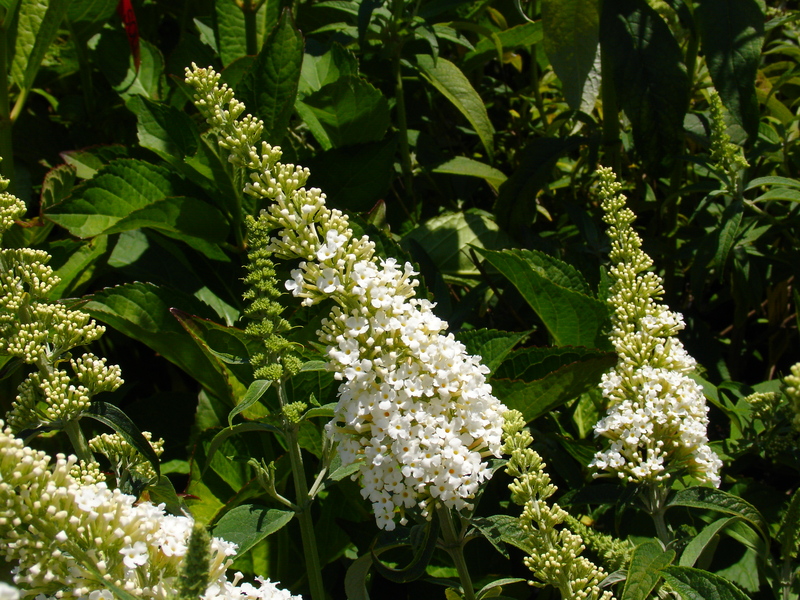 •It reinvigorates tired plants, allowing them to last for many more years in the garden. •It keeps the overall size of the clump in check. •Divisions are guaranteed to be the same cultivar as the original plants. This can be very helpful to gardeners that don’t know the exact variety they have in the garden, but want to make a perfect match. Once you “decide to divide”, do yourself a favor and enlist a friend. Large clumps have extensive, deep root systems that are extremely heavy, the more help the better. Before you begin, prepare the work area by laying down a tarp next to the plant and gathering your tools. Hedge trimmers, a heavy steel spade, sharp axe, wheel barrow, and a good pruning saw could all help the job along. I tend to use the spade to do all the digging and dividing, but a selection of tools is best. I’ve heard a reciprocating saw with a 12″ blade can be very handy to make the divisions once the clump has been liberated from the ground. 1) Cut back the desiccated foliage. Have your friend either tie the blades into a bundle or hold them together in his arms. Using the hedge trimmer, cut the foliage off between 6 and 12″ from the ground and discard it. 2) Dig the clump out of the ground. Dig around the plant, about a foot from the edge of the clump. The first time around, just focus on making a good track to work from. Continue to dig progressively deeper and under the clump, until it can be “popped” free from the soil, using the spade as leverage. If you have trouble pulling the clump out, try rocking it back and forth while your partner slides a tarp under it. Then pull it out of the hole on the tarp. Alternatively, cut the clump into smaller, lighter sections right in the ground and then pull them out. 3) Make the divisions. With a sharp spade, saw or axe split the clump in half. Continue to cut it up into more or less equal sections that can be replanted. Keep in mind, the ideal division will be from the outside of the clump and at least as big as palm of your hand. Don’t make divisions from the weak, woody center of the clump. This is the oldest part of the plant and will not transplant well. 4) Don’t allow the roots to dry out as you work. Although grasses are very tough, like any plants, they don’t like to have their roots dry out. Keep the bare roots covered as much as possible, and if they start to get dry, give them a light sprinkle with the hose. 5) Replant one division to replace the original plant. Grasses prefer lean soil that is not high in organic matter. Do not amend the backfill or add fertilizer. Just place the division in the hole and plant with the native soil. Gently press the soil against the roots as you back-fill to be sure the roots have good contact with the soil and that there are no air pockets. 6) Water the new plant well. Make a berm around the plant with soil. Fill the berm with water and let it drain, then fill it one more time. As the plant roots and new top-growth appears, it will still need regular water. Once the plant is established, flatten out the berm and mulch around the base. 7) Pot up what you can’t plant right away. Ornamental grasses are a great gift for your fellow gardener, why not pass a few along? * Never feel guilty for discarding extra plants if you have no use for them. They are better in the compost than an annoyance to water or jammed into places in the garden they shouldn’t be. TRUTH: All plants need water! Drought tolerant plants are those that, once established, will survive receiving the typical (or slightly less than typical) amount of rainfall in our area without the need for supplemental irrigation. But to be clear, surviving isn’t necessarily garden tour ready! Prolonged periods without rain force the plant to conserve water in its most important tissues. With herbaceous plants, that’s the roots. For woody plants, this also includes the framework above the ground. Plants need a lot of water to produce new growth and keep their leaves hydrated. So, during times of drought many plants will stop growing all together and begin to shed leaves. Some plants will go completely dormant, and appear like they normally do in winter, with no sign of life at all above the ground. In order to keep your plants looking their best, it’s a good idea to give them a deep soaking if it seems dryer than normal. Keep in mind, plants that are considered drought tolerant generally have very extensive root systems, or a long taproot. When plants fresh from the nursery are put into the ground, they don’t have those roots yet to help them pull in moisture. We recommend keeping the area around new plants consistently moist (not soaking) for at least the first two weeks after planting. This give the plant time to send out new roots into the surrounding soil. After the first two weeks, monitor the soil in the bed. If there isn’t enough rain to keep the soil damp down a few inches, water weekly. Ornamental grasses continue to gain popularity. Even ten years ago, there were only a few varieties available, and even fewer gardeners who planted them. Today, there are hundreds of named cultivars, giving gardeners a wide variety of forms to chose from. Fountain grasses are widely adaptable, rounded, clump-forming grasses. They are easy to grow, very deer resistant, and not bothered by insects. They look great as accents in containers, as mass plantings, or in mixed borders. The mounded shape is punctuated by bottle-brush shaped flowers from mid summer to fall. •P. alopecuroides: The species form of hardy fountain grass. 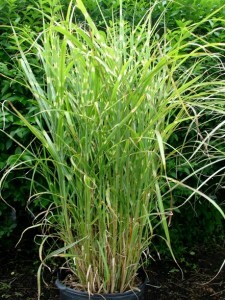 Tallest of the commonly available fountain grasses at 4′ tall. Flowers appear in late summer. •P. alopecuroides ‘Hameln’: Referred to as a dwarf, this plant still reaches a solid 3′. Flowers appear in mid to late summer, before the species. •P. alopecuroides ‘Little Bunny’: There are more and more truly dwarf fountain grasses becoming available. ‘Little Bunny’ originated as a seedling of ‘Hameln’, and is now widely available. It only grows to 18″. Flowers in Mid to late summer. •P. alopecuroides ‘Maudry’: One of the latest blooming fountain grasses. Tops out around 2′. This cultivar has somewhat wide, deep green foliage. Nearly black flowers appear in October on short, stocky stems. Tends to self-sow. •P. orientale ‘Karley Rose’: Early blooming variety with pink plumes. reaches 3′ tall and 2′ wide. Flowers begin appearing in July and continue through fall. •P. 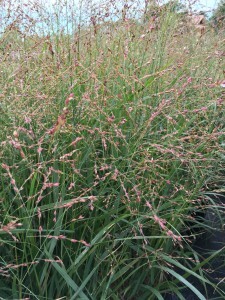 setaceum ‘Rubrum’: Annual Red grass. Blades are entirely burgundy in color. 5′ tall x 3′ wide, with stunning plumes in late summer that arch above the foliage. Ornamental grasses have been a part of gardening on Nantucket for years. 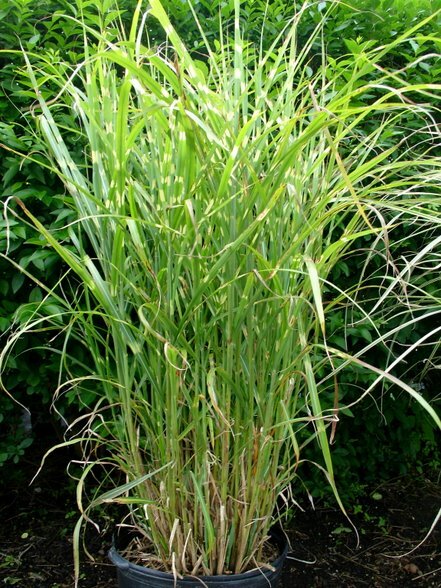 They come in many shapes and sizes, the largest of which are Miscanthus. 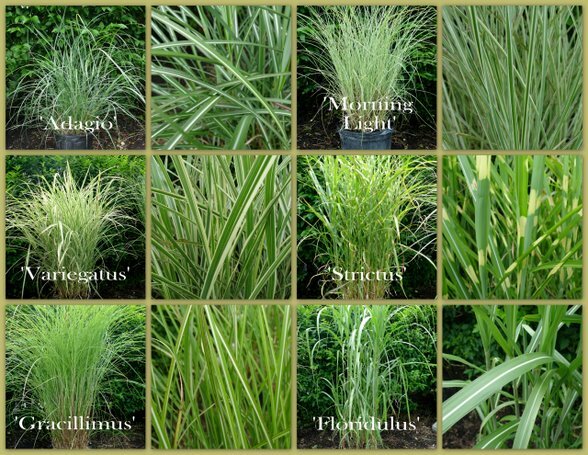 Miscanthus has many common names, but most often it is referred to as Maiden Grass or Eulalia. Although they are native to Asia, many of the cultivars are extremely hardy and long lived plants here on the island. 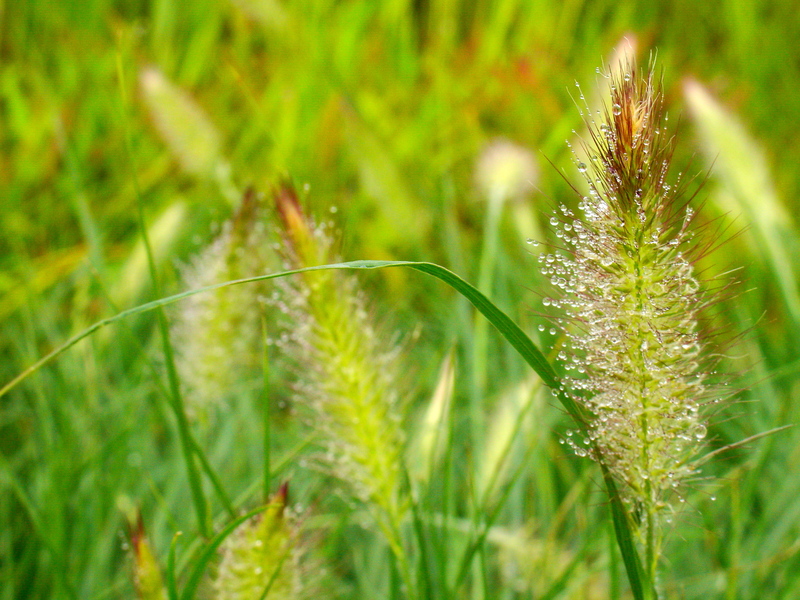 The upright, or arching blades of these warm-season grasses appear in late spring and quickly stretch skyward. In fact, varieties such as floridulus will reach upwards of 10 feet in one growing season! ‘Gracillimus’ is a common variety used as a vertical element in the back of mixed borders or as screening in the summer. It’s fine foliage will reach 6 feet by August, and its inflorescences (flowers) will tower above that in the Autumn. As well as giants, there are also dwarf varieties. ‘Adagio’ is a fantastic plant that forms a wide clump 5 feet tall and wide. ‘Little Kitten’ tops out at 15 inches, and is a great choice as the upright element in a container garden. There are even different colors in the foliage. ‘Strictus’ develops a pronounced yellow spotting on the blades as they mature. ‘Morning Light’ has a distinct silver tint to it, with a fine variegation. One of the Miscanthus with the most pronounced striping is aptly called ‘Variegatus’. It has a broad blade with wide white bands that run up and down the blades. At Surfing Hydrangea Nursery we stock many varieties of Miscanthus, including many not mentioned in this article. We would be happy to show you our grass section! Pictured below are several common varieties of this versatile grass. What would a Nantucket garden be without one ornamental grass or other? From Pennisetum ‘Little Bunny’, to Miscanthus sin. ‘Gracillimus’, there is a grass for nearly everyone and their landscape. These tough plants are not troubled by pests, diseases, rabbits or deer, and many display showy plumes or vibrant foliage later in the season. During the first few years after planting, the only maintenance most grasses need is a hair-cut in spring to take off the previous season’s growth. 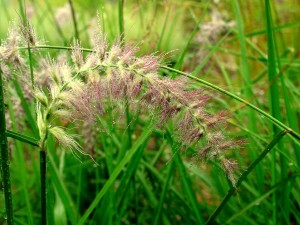 Over a period of years, the larger grasses can decline, and may need division. Spring is the best time to divide warm season grasses like Miscanthus, taking advantage of the increased root growth that takes place as the plants break dormancy. Spring is also the best time to install new plantings of these grasses. We have a varied selection of ornamental and native grasses already at the nursery, and will continue to bring in more as the season progresses. Ammophiila breviligulata. This is the native beach grass used to stabilize and beautify dunes and other stretches of very sandy soil. Because beach grass is usually used in large quantities, it is most often planted as either bare root (culms) or small rooted plugs. Availability for bare root material is restricted to times when it is completely dormant; In the spring March though mid May and after mid September in the fall. The stalks are typically planted at a rate of 2 per hole with 1 foot square spacing. Rooted plugs are actively growing and make a quicker initial showing, at a slightly higher cost. They are also planted at 1 foot square spacing, at a rate of one per hole. 6 inch pots and one gallon pots are sometimes available. Of course, any of these can be planted more densely, which is recommended in high erosion situations. In all cases, the root zone of the grass must meet moisture to grow. Because of the sensitivity of coastal environments to over-fertilizing, no fertilizer is recommended for beach grass when planted in an area where it would be native. Beach grass may also be inter-planted with other native species to increase beauty and biodiversity.